Angular expansion joints | SPA "Mariland"
Angular expansion joints are used to compensate for the deformation due to thermal expansion occurring in the areas where the pipeline changes direction. In contrast, axial, angular expansion joints not used alone, but only in a system of two or three joints, called compensation system. Compensating the ability of such a system depends on the distance between the joints and compensatory ability to apply them in the bellows. Angular expansion joints do not pass spacers efforts on pipeline supports. Sometimes, for properly work of expansion joints system it’s enough to install additional suspension swinging support. At short distances, near heating equipment, installation supports often does not need to. On long sections need to install the guide supports front compensators. Installation of pipeline should be designed to prevent the occurrence of torque. On long sections need to install the guide supports front expansion joints. Installation of pipeline should be designed to prevent the occurrence of torque. To ensure efficiency while reducing the length of the portion of the projection on the axis of pipeline when it is tilted (h). When changing direction pipeline in the same plane, the angular expansion joints used with a a hinged connection. If the pipeline changes direction perpendicular to the plane, use the angle expansion joints with universal cardan joint. 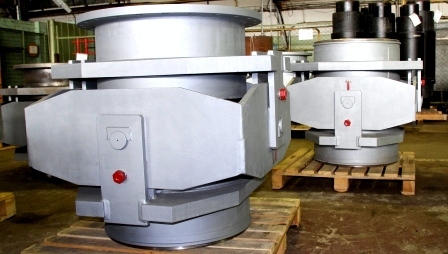 SPA «Mariland» Ltd. produces angular expansion joints with a nominal diameter of DN 40 to 1200 mm to operate at a nominal pressure of PN 0.1 to 2.5 MPa.